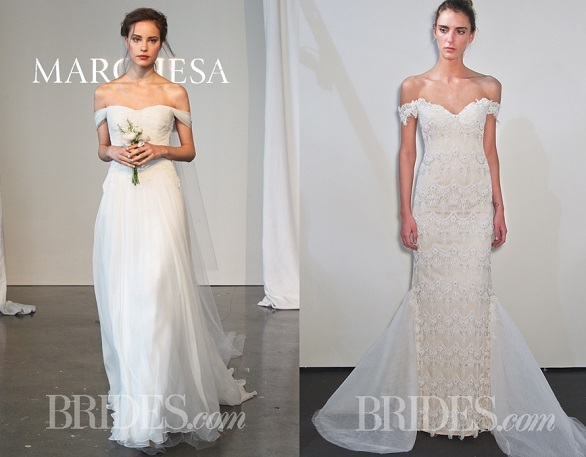 The Spring 2015 Bridal Runways are just wrapping up, and every season we get to witness what’s on the cutting-edge of wedding dress design. From new necklines to interesting embellishments and fashionable fabrications, each season presents a slew of exciting new trends. This spring was no different, with a handful of unexpected necklines, skirt options, colors, and accessories at play. More than most runway seasons, this round of presentations left our hearts flurrying with excitement for what’s to come in the bridal world. Off-the-shoulder necklines, bold colors, tulle overskirts, capes, and collars infused many of the designers’ collections with a breath of fresh air. Off-the-shoulder necklines were a natural progression for many bridal designers like Oscar de la Renta. This time, the romantic draped shoulder shined. It’s a great option for brides who want a sleeve, but don’t want to look too covered. Can you say modern-day Belle? 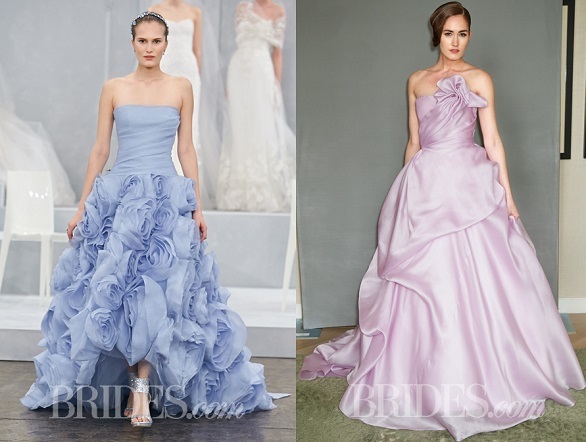 Next, new colors emerged in many of our favorite dressmakers presentations.. Blues, grays, and even mint green creations stole the spotlight from the blush, ivory, and of course, white gowns we’re accustomed to seeing. The most creative dresses boasted convertible skirts, particularly in tulle. Adding a playful and ethereal vibe, designers like Hayley Paige and Theia crafted new silhouettes that offer a versatile, whimsical, and modern options for their big day. Brides that want to ensure a dramatic walk down the aisle will love a cape. Whether it’s a sweet sheer illusion with appliqués like D.I.D.’s or a sweeping, full-length overcoat. A cape allows you to cover up for the ceremony and helps create two looks from one. This article was first found HERE.